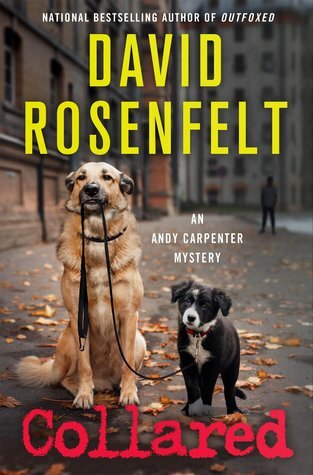 From Goodreads ~ Lawyer Andy Carpenter's true passion is the Tara Foundation, the dog rescue organization he runs with his friend, Willie Miller. All kinds of dogs make their way to the foundation and it isn't that surprising to find a dog abandoned at the shelter one morning, though it was accompanied by a mysterious anonymous note. But they are quite surprised when they scan the dog's embedded chip and discover that they know this dog. He is the "DNA dog". Two and a half years ago, Jill Hickman was a single mother of an adopted baby. Her baby and dog were kidnapped in broad daylight in Eastside Park and they haven't been seen since. A tip came in that ID'd a former boyfriend of Hickman's, Keith Wachtel, as the kidnapper. A search of his house showed no sign of the child but did uncover more incriminating evidence, and the clincher that generated Wachtel's arrest was some dog hair, notable since Wachtel did not have a dog. DNA tests showed conclusively that the hair belonged to Hickman's dog. Wachtel was convicted of kidnapping but the dog and baby were never found. Andy is a criminal defense lawyer who doesn't want any clients ... he's even considering not sending in the paperwork to keep his license up-to-date. Because of the millions his father left him, he is able to not work and spend his time with his friend, Willie, running the Tara Foundation, a dog rescue that he and Willie formed. He is married to Laurie and they recently adopted eight-year-old Ricky, so he is enjoying family life. A dog is abandoned at the dog rescue and a chip and DNA show that it is Cody, a dog that has been missing and presumed dead. Three years ago, Laurie's friend, Jill, had broken up with her boyfriend, Keith, and then adopted a baby named Dylan. Cody and Dylan were kidnapped shortly thereafter and evidence pointed to Keith to be being the one who took them. He ends up being convicted and sent to prison. With the dog reappearing, Jill asks Andy and Laurie to investigate. Andy eventually is hired by Keith when the case is reopened and sent back to court. This is the sixteenth in the Andy Carpenter series (I've read them all). I enjoyed this book and am really enjoying this series. The story was interesting and there were some twists and turns along the way. Even though it is part of a series, it works as a stand alone (so you don't need to have read the ones before it to know what is going on). I like the writing style of this author as it was funny, sarcastic and amusing. It was written mostly in first person perspective in Andy's voice. I like Andy ... I think he would be a hoot to be around and he's quite generous with his time and money. He loves his dog, Tara, and thinks she's the most wonderful and smartest dog in the world. He also has another less lively dog named Sebastian who came with Ricky. Part of Andy's team is Laurie, his wife and former police officer and now his investigator. Hike is his associate who is the most depressed and downer person ever but in this book we see "Pod Hike". Marcus, an investigator with persuasive reasoning skills, continues to provide protection when it's most needed (which is often since Andy is a self-professed coward). Sam is his accountant who is also a computer hack but wants to get more action like shooting people.